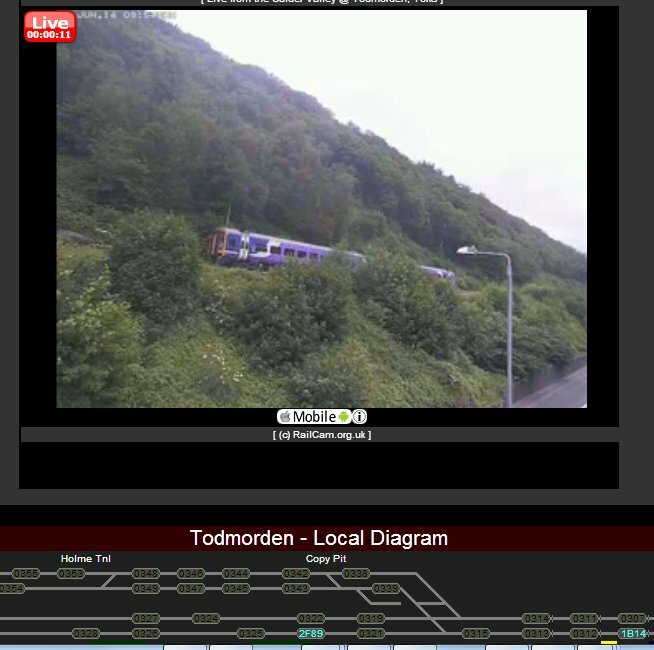 The Railcam Website offers a number of features of direct relevance to Todmorden. The site's owners have very kindly provided a Webcam operating (almost) in realtime located in one of the old mill buildings in the vicinity of Eastwood Station and pointing eastwards. The Webcam can be accessed here. 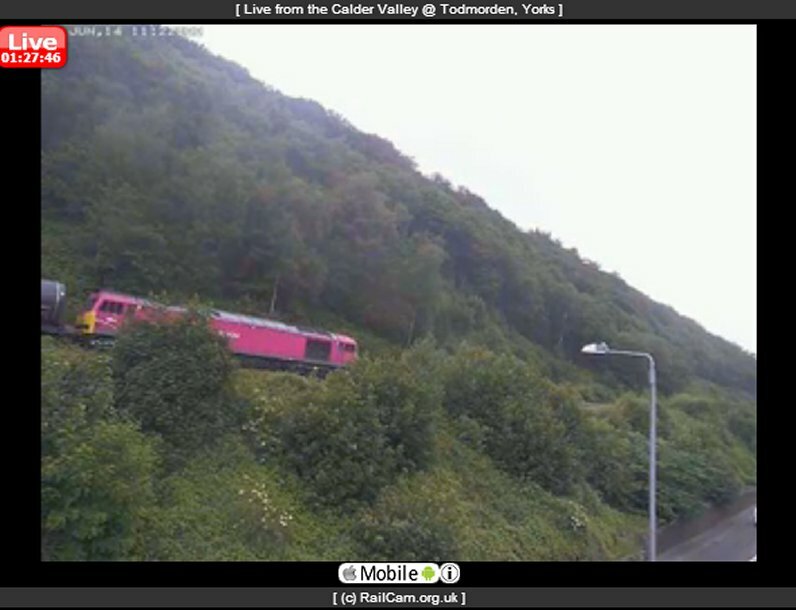 This is a very laudable effort by Alex Howarth, who is running Webcams as far west as Dawlish and as far north as Dalmuir. How does he do it? I suspect there are some friends who live or work near railways involved. Alex is offering a free service with the option for supporters to make a voluntary contribution of £10 a year. Given that Virgin charge a £4 for an hour of on-train Wi-fi, this is remarkable value for money and deserves support. It's possible to see the RailCam cam on Google Streetview. Users should note that although the feed is 'live', the clock shows that the scene appears on your screen some four minutes after the event. There is, however, a handy clock in the top left hand corner which allows orientation when used in conjunction with the Realtime Trains Website. You need to remember that trains pass Eastwood 2 minutes after leaving Hall Royd Junction in the Leeds direction, and pass the cam two minutes before getting to Hall Royd in the Manchester direction. Alex has also tapped into the Open-source Network Rail Data Feeds, and has started to offer a series of signal box diagrams which show which signals currently have a train standing or passing them, and the identity of the train. There is a diagram for Hall Royd and the wider Todmorden area, which is currently 'OOU' (Out of Use) as, of course, some idiot in Preston Power Signal Box has gone and added a whole load of new signals and a curve to boot. As a taster, some screen grabs from the Eastwood cam are shown below. 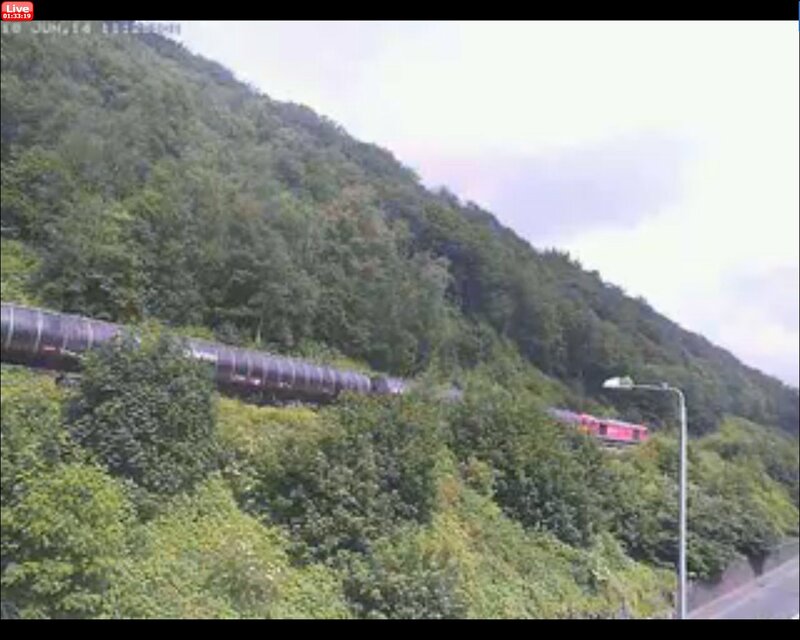 Screengrab from Railcam's installation at Eastwood, showing 683J, the ex-0855 Preston Docks Lanfina to Lindsey Oil Refinery train at 11:24 on Wednesday 18 June 2014. I was in place to capture the 9 loaded tanks heading for Preston at 06.15, but the 'Print Screen' function missed the event. Suffice to say, the tanks were running 4 minutes early. Instead, here is 1B14 on its way from York to Blackpool North running to time at 09.57. Running 2 minutes early, the returning tanks (648F) were caught passing Eastwood at 11.20 hrs. Nine loaded to Preston; 15 empty on the return. The last freight of the day was 600K 16:05 Seaforth C.T. Mdhc (Ews) to Tinsley S.S. due at 18:51 but despite being ahead of time earlier in the journey, passed Eastwood at 19:07. The train consists entirely of empty flats. 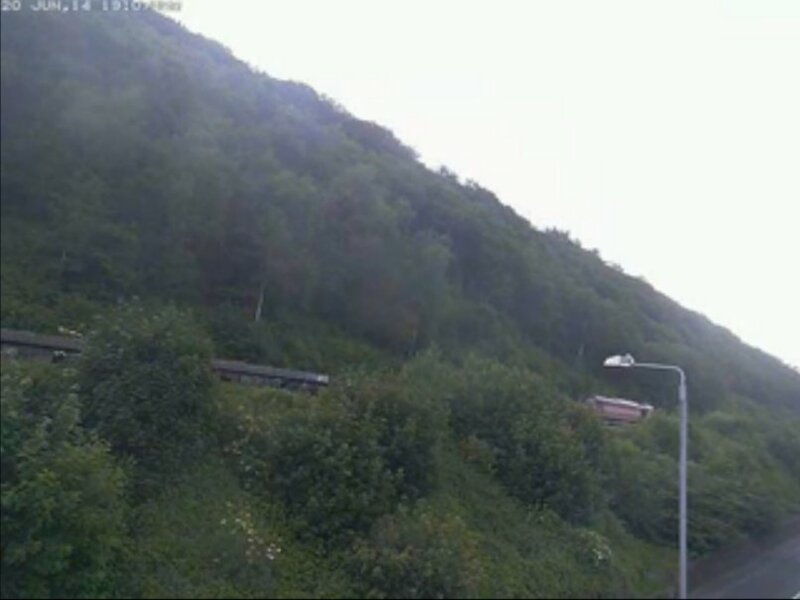 For those who wondered what a RailCam might look like, here is the Eastwood RailCam caught by Google's Streetview Cam!